some vegetable preferable with bright color, e.g. carrot, yellow/ red bell pepper, etc. In a frying pan, add a bit of oil, saute the shallot for a minute, add beans and all vegetables, cook a few minutes more, salt and pepper to taste. 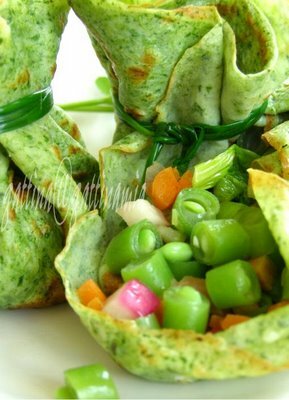 In a big mixing bowl, whisk to combine eggs, milk, plain flour, blended spinach, a few dash of salt and pepper. What you looking for is a fairy liquid-ty batter. Heat a non-stick skillet with a bottom's diameter of 18 - 20 cm. Thinly coat it with oil, pour in some batter and keep swirling the pan until it's all coated by a thin layer of batter, cook over medium heat. After one side turns golden brown, flip it over to the other side to cook. thank you! 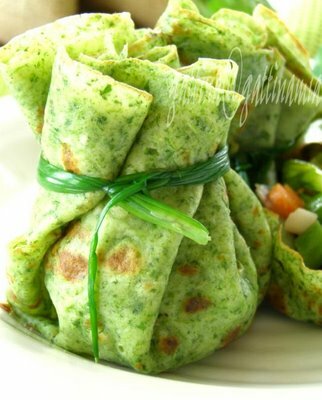 I like spinach so I think the crepes are very delicious. What a beautiful post !Excellent presentation. beautiful beautiful.. green crepes is something new to me. But then, I always learnt something new from here. Thanks so much.